Managing purchase orders you have placed is an important part of running a medical supply facility. There are two main windows you will use to do this, along with a variety of reports. Choosing this Suppliers > Show outstanding purchase orders from the menus or the Navigator displays a list of all lines outstanding on all confirmed Purchase Orders. In the toolbar there is a field to enter searches. To the left of the field you can choose from the drop down list what to search for. You can restrict the list displayed to a single supplier, to a single item, or to items whose delivery is expected within a specific number of days. This search excludes finalised orders. Choose Suppliers > Show Purchase Orders. In the find window you can choose what will be displayed. By default mSupply displays the last 15 purchase orders. You will be shown a list of matching Purchase Orders. Double-click a purchase order to open it. 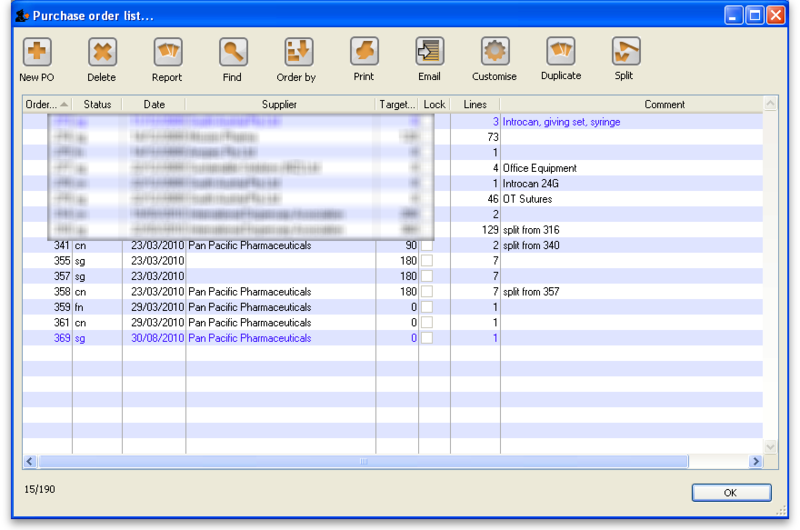 Previous: Ordering Items From Suppliers Next: Purchase Order categories.